Hebrew instructor Tom Blanchard (Daily Dose of Hebrew) recently returned from career missionary work in Switzerland for retirement. As he was passing through Louisville, KY, there was a unique opportunity to gather many of the Daily Dose team. 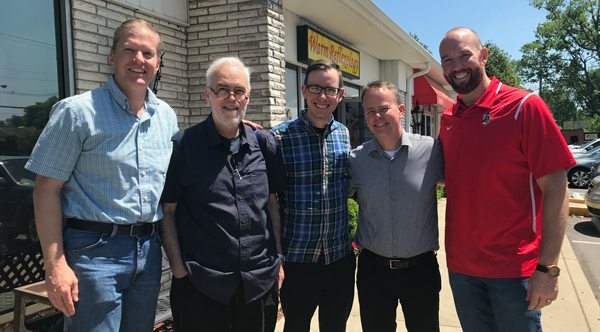 In this photo (left to right), you will see: Brad Clark (full-time UPS pilot, volunteer webmaster), Tom Blanchard (DDH weekend contributor), Jonathan Ahlgren (MDiv student, tech expert), Rob Plummer (Southern Seminary professor, DDG founder), and Adam Howell (Boyce College professor, DDH). We were missing Mark Futato (Reformed Theological Seminary professor, DDH), who lives in Florida. We experienced Christian joy and unity together as we discussed our common passion to help pastors and other Christians stay in the Hebrew Old Testament and Greek New Testament! After enjoying some delicious Cuban food for lunch, we stepped outside the restaurant to take this photo. We wish you had been able to join us! We love our Daily Dose subscribers.